A Scottish company is betting big on whiskey-powered vehicles. BBCThe rental car filled with whiskey biofuel. We’re told not to drink and drive, but using drinks to drive may actually be a good idea. This week, Edinburgh, Scotland-based company Celtic Renewables sent a rental car filled with its whiskey (or as the Scots say, “whisky”) biofuel on a short trip. 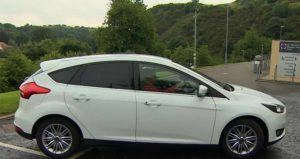 BBC Scotland reporter Lisa Summers drove the vehicle in the first-of-its-kind sojourn, and reported that the car rode smoothly. This marks a big win for Celtic, whose fuel — made from pot ale and barley kernels — can be used in cars that otherwise use oil or diesel. While many environmentalists are calling for a transition to electric cars, biofuels — and particularly this kind of biofuel, biobutanol — offer a relatively cheap and clean stop-gap solution as manufacturers bring electric vehicles to scale and push associated costs down. An array of biofuels have been developed over the years to varying degrees of success, and it’s no small wonder that a “whiskey-powered” car has taken off in Scotland. Indeed, the BBC reports that the nation produces nearly 750,000 tons of barley kernes and two billion liters of pot ale — the yeasty remnants of whiskey in the process of fermentation — each year. If not used in biofuel, Celtic founder and president Martin Tangney said that the ale would go to the dumpster. Instead, Tangney said he and his colleagues opted to use the ale to develop something entirely new. With an $11 million grant from the government in tow, Tangney and his colleagues are in the process of building a commercial plant for developing the fuel. He anticipates that the plant will be in full force by 2019, produce up to 500,000 liters of the fuel annually, and make up a $128 million industry for Scotland. But most importantly, he told Reuters, the move will help carve out a less wasteful future. Next, read up on how the city of Baltimore has used solar power to remove over one million pounds of trash from its waterways.